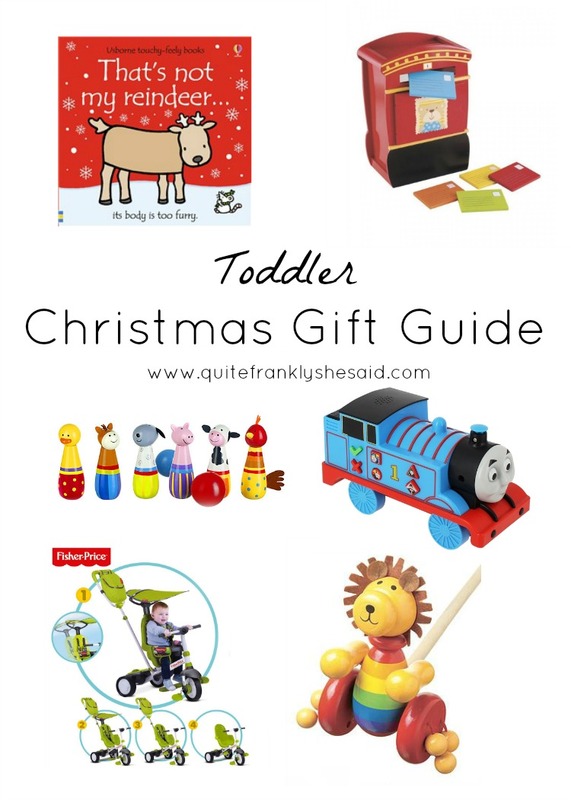 Christmas is fast approaching and so I have put together a selection of my top gift ideas for children. 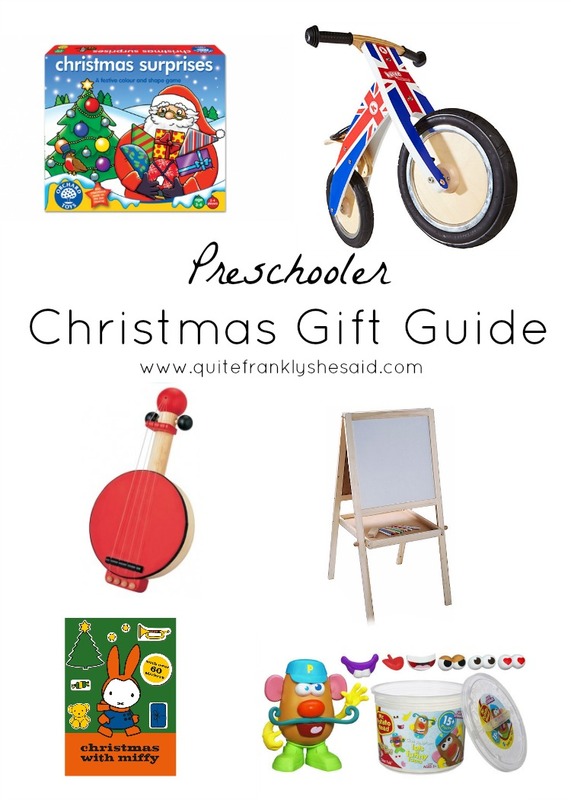 Whether you are shopping for babies, toddlers or preschoolers, I have a Christmas present idea for every child. 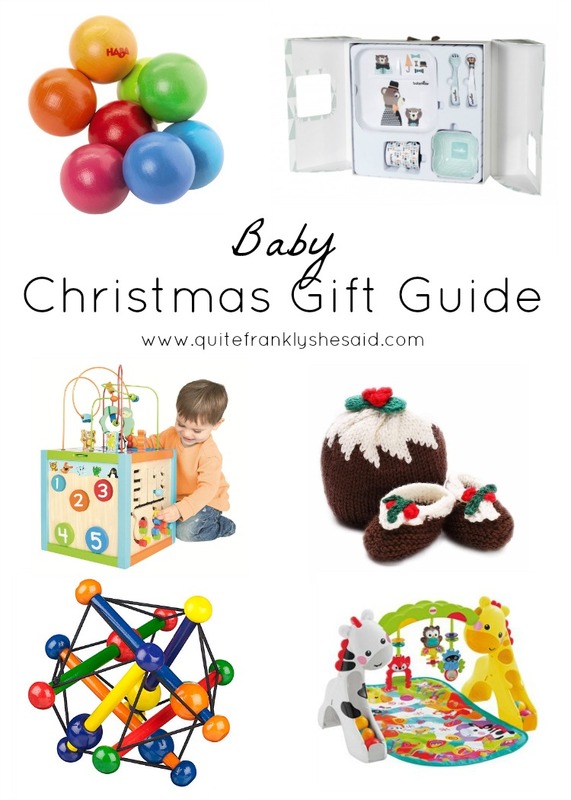 My gift ideas are perfect whether they're a boy or a girl, and I have something to suit all budgets too! Haba Magica Teething & Clutching Toy £9.99 I have always loved brightly coloured wooden toys for my children and Haba toys are wonderful. This toy has lots of colourful 1-inch balls which babies will love to touch, feel and shake about. It's quite therapeutic for adults too! Manhattan Skwish £12.50 This squishable toy is made from wood and elasticated string with moving beads to help encourage visual and touch senses. Babymoov Lunch Set £24.99 Baby's first Christmas lunch is a big milestone and what better way to make it special than with their very own lunch set. This set from Babymoov is available in four designs and contains a bowl, plate, cup, fork and spoon. It comes beautifully packaged and ready for gifting. Ana Gibb Christmas Pudding Hat & Booties Set £25.00 I wish my boys were still small enough to fit this adorable set! Made from merino wool it will keep little ones warm and cosy this winter. Available in size 0-3m, 3-6m and 6-12m. Wooden Activity Cube £39.99 Baby J got one of these last Christmas and it is still a favourite now. With flip-and-match animal friends, swiveling peekaboo counting circles, spinning gears, a tracking maze, a bead maze and wooden animals, there is so much to explore and learn. Fisher-Price Newborn-to-Toddler Play Gym £56.99 Baby J got this baby gym when he was about 4 months old and has only recently stopped playing with it now at 14 months old. It grows with your child meaning they get a lot of play out of it. You can read my review here. Usborne That's Not My Reindeer Book £6.99 We love the "That's Not My..." series of books by Usborne and have quite a few of them now! They feature simple, repetitive text and touchy-feely pages to introduce children to new textures and sensations. Wood and Wonder Push Lion £8.95 Baby J has got the push chicken from this range. It's great for little ones who are finding their feet and the clacking beads make a fun sound! Orange Tree Farmyard Wooden Skittles £14.99 Baby J got this gorgeous set of wooden animal skittles for his first birthday. They are bright and colourful and so much fun. ELC Wooden Post Box £15.00 This is another toy that Baby J got for his first birthday a couple of months ago - we bought it as he loves to post things into the bin and we thought it would be a good distraction! It's a lovely way to introduce learning about colours and role play. Thomas & Friends Push & Learn Thomas £19.99 The ultimate train for fun and learning! This brilliant toy helps little ones discover numbers, letters, colours, shapes and characters from Thomas & Friends. I reviewed it here. Fisher-Price Charisma Trike £74.99 This is a unique 3 in 1 tricycle that has three stages and grows with your child, from parent-controlled like a stroller to an independent trike. You can read my review here. Christmas with Miffy Sticker Book £5.00 This sticker and activity book is packed full of fun things to do and lots of festive stickers. Perfect for any Miffy fan! Orchard Toys Christmas Surprises Game £9.50 Orchard Toys make learning fun and this game has two games in one! One side has a colour match game where children match the baubles to the Christmas tree, while the other side has a shape game where children match the shaped presents to those in Santa's sack. Mr Potato Head Tater Tub £17.99 Such a classic toy! Your little one will have so much fun creating silly faces with this fun set. There are lots of different combinations they can come up with, they'll never get bored of this. Plan Toys Banjo £24.98 This is a wonderful way to introduce children to musical instruments. They can strum the strings for a typical banjo sound or tap the drum to create a beat. ELC Double-Sided Wooden Easel £30.00 A great way to encourage writing and drawing skills, this double-sided wooden easel comes with chalks and an eraser too. It is currently on offer at £15.00! Kiddimoto Kurve Balance Bike £64.99 Balance bikes are a great way for children to learn bike skills before they get a pedal cycle, and they can learn without ever needing stabilisers! This funky Union Jack balance bike is the perfect first bike. What will you be getting your children for Christmas?